I hope you had a wonderful Thanksgiving yesterday. Today is Fashion Friday and it's all about the veil. Although I've never been married before, I've seen how a veil can turn a wedding gown into "the wedding gown", as I've help many brides choose the perfect wedding dress. 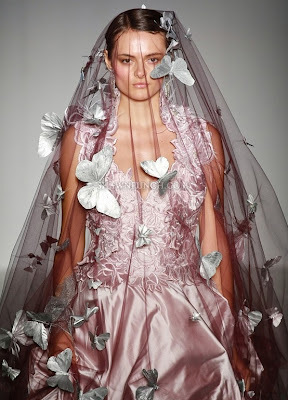 I think veils can give a wedding dress a little bit of drama as well as a little bit of romance. Today, I have a collection of some of my favorite and most dramatic wedding veils. I hope you enjoy them as much as I do. Whether you choose something subtle and romantic or bold and dramatic for your wedding day, your veil is sure to make your wedding gown that much more beautiful!